A few months back, I bought a cookbook for just one recipe. The book was Marion Cunningham's The Breakfast Book. The recipe was Cream Biscuits, i.e. the most perfect and foolproof biscuits that ever were. I read about them on Molly's site and knew at once that whatever book they were in was a book I should own. I have something of a history when it comes to buying books based on one great recipe. When I was in college, I bought The New Best Recipe because a friend had made these thick and chewy triple chocolate cookies from it that absolutely blew me away. I bought Nigel Slater's Appetite because our friend Josh made this oxtail stew that had me going, against all good judgement, for a fourth helping. So I wasn't too worried that a biscuit recipe, already available online, had me jonesing for a book. I figured there were plenty of other things in it worth making. Nutmeg Muffins were the second recipe I made from The Breakfast Book. The recipe jumped out at me because rarely, if ever, do you see nutmeg in the title of a recipe. Cinnamon, sure – that’s a flavor. I’ve had cinnamon cookies and cinnamon buns and even cinnamon ice cream. But nutmeg is a supporting cast member. It’s what makes béchamel sauce and cheese soufflé and eggnog taste so distinctive, but it’s also just barely there. Nutmeg muffins aren't the sort of thing I’d think to make, but here was this book, which I’d bought on impulse because of some biscuits, and it was claiming the “Last Word in Nutmeg Muffins.” Better follow instructions. That’s a whole lot of nutmeg. Yowza. Mysteriously missing from the ingredient list? Vanilla. Or, come to think of it, any other flavoring at all. This is a bare-bones muffin batter with nutmeg carrying the heavy lift. After making them, and restraining yourself multiple times from adding just a splash of vanilla, you might be as surprised as I was to bite into a muffin still hot from its bake and learn that it is delicious. The nutmeg is a subtle flavor, but it isn’t bland. It’s there, and it’s actually quite complex, if you give it your attention. With a spot of jam, these muffins are perfect. Having served them once to guests and once to just my unsuspecting wife, I guarantee folks will look at them puzzled and ask you what secret thing you tucked inside. You’ll tell them it’s just nutmeg; they won’t believe you. And then, maybe they’ll be as intrigued as I was by the subtle genius of this recipe that they’ll figure there must be other great recipes where it came from, so they’ll buy the book. And they’ll be right. Note: When making a bechamel or a souffle. maybe you use ground nutmeg from the jar. You can't do that here. Nutmeg is the star of the show; it must be fresh. You can get it at Indian markets, some Whole Foods, specialty stores, and online. As my friend Josh told me, the first time he cooked with fresh whole nutmeg, he promptly took his jar of ground nutmeg off the shelf and threw it away. Now that's a meaningful difference. Preheat the oven to 400° and grease a muffin tin. Even if you line it with paper, spray the liners. These muffins really stick. If you have silicone liners, you’re in the clear. 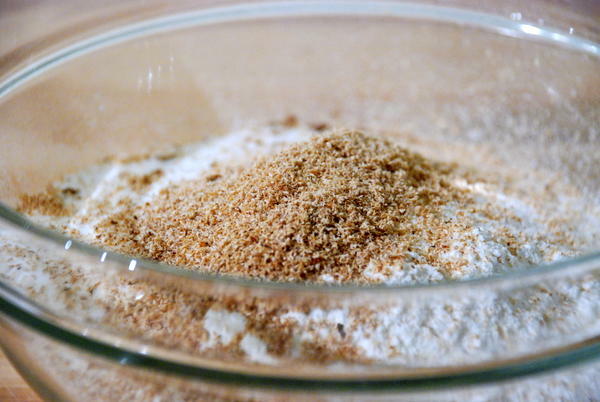 In a large mixing bowl, combine flour, sugar, baking powder, salt, and grated nutmeg. In a separate medium bowl, beat together the egg, cream, and milk until mixture is smooth. Add butter and stir to combine; little bits of the butter will solidify, which is totally fine. Use a ¼-cup measure to scoop muffin batter into the tins. You’re aiming to fill the tins ¾ of the way full. Once you’ve added batter to all 12 tins, distribute whatever’s left evenly. Bake the muffins for 20 minutes, until just starting to turn light brown. Remove from the oven and set on a rack to cool for 5 minutes, or – whom are we kidding – be a good host and bring’em straight to the table so folks can dig in while they’re piping hot.